Democratic presidential hopeful Sen. Kirsten Gillibrand backs the Green New Deal, a plan to reach net-zero greenhouse gas emissions in the United States, likely ending fossil fuel use and production. But the New York senator wasn't always so antagonistic to fossil fuels. When natural gas companies were eyeing upstate New York's Southern Tier for potential hydraulic fracturing and production, from about 2009 to 2014, Gillibrand regarded the industry as a potential "economic opportunity" for the region. Gillbrand was a one-term congresswoman representing a vast rural district in upstate New York when she was selected by then-Gov. David Paterson (D) to fill the seat left vacant when Hillary Clinton went on to become secretary of State in the Obama administration. "The Marcellus Shale represents a tremendous economic opportunity for New York," she wrote in 2009 to New York's state Department of Environmental Conservation, which at the time was considering whether to regulate or ban the practice — a process that ended with a 2014 decision by Gov. Andrew Cuomo (D) to ban it. "With regard to hydrofracking, it's a significant economic opportunity, and a potentially clean source of energy," she said in a 2012 campaign debate. In the debate, like most times she spoke about fracking, Gillibrand said the gas recovery process should only be allowed if, among other things, it's proven to be safe and the chemicals used are made public. "All I'm saying is, yes, it's economic opportunity, but before we destroy our clean drinking water that powers two major industries, we should make sure we have all the facts," she said, referring to tourism and agriculture, which both need clean water. Gillibrand's shift came as her profile grew from a lawmaker representing an upstate New York district — not one that would have likely had fracking itself — to a national figure, culminating with her launch of a presidential exploratory committee and a likely coming announcement of an official filing of her candidacy. Robert Holahan, an environmental studies professor at Binghamton University in upstate New York, said Gillibrand is playing to a different constituency and audience now than she did years ago when she was more open to fracking. "When she a congresswoman from upstate New York, she probably did see it more as an economic issue than an environmental one," Holahan said. "And then if she takes more of a national role in the party, she has to appeal to a larger group," he said. She has similarly shifted her views in areas like gun control and immigration. Going back to her time in the House, she held conservative or moderate positions on both, but has since moved left. Her record has led to accusations she changes her views based on what is politically convenient. 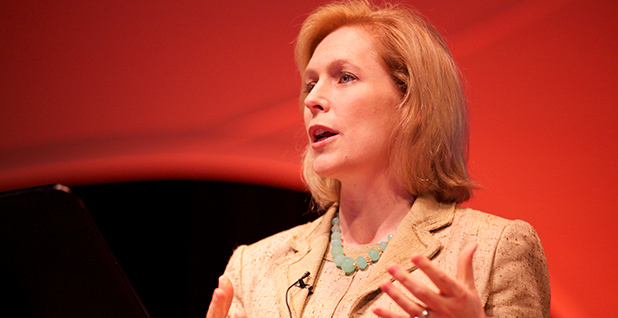 Gillibrand didn't completely let the gas industry off the hook. For example, she has been a lead sponsor since 2011 of the "Fracturing Responsibility and Awareness of Chemicals (FRAC) Act," which would subject fracking to federal regulation by EPA and mandate that companies disclose the chemicals they use. But now she is a lead sponsor of the Green New Deal, along with a handful of other Senate Democrats, including other candidates for president. Evan Lukaske, a campaign spokesman, defended Gillibrand's record in a statement to E&E News, saying she "has consistently pushed for tough regulations on the fracking industry to ensure the American people have clean water and air." Lukaske pointed to Gillibrand's record of pursuing new environmental standards for fracking, like co-sponsoring legislation to require disclosure of fracking chemicals, backing a proposal to open fracking up to EPA water pollution regulation and voting against a proposal to ban EPA from regulating greenhouse gases. "Senator Gillibrand is proud of her exceptional record on this issue," he said. Lukaske did not answer whether Gillibrand believes fracking should be allowed to continue. Gillibrand declined to answer questions about her fracking position when asked at the Capitol. While the Green New Deal resolution she's signed on to is nonbinding and doesn't mention banning fossil fuels, it would endeavor to bring the United States to net-zero greenhouse gas emissions, allowing for emissions from sources such as agriculture and international air travel, but not much else. It would also seek to shift the nation's power supply entirely to renewable energy. Electricity was the second-largest use for natural gas in 2017, according to the U.S. Energy Information Administration. Gillibrand speaks frequently about the Green New Deal on the campaign trail and in media appearances but does not talk about whether fossil fuels would still be produced or used. "I do believe ideas like the Green New Deal will be bipartisan because the components of that bill already are, and there's only three basic things to the bill," Gillibrand told WBUR's "Here & Now" on March 7. She said, as she has in other interviews, that the Green New Deal is about three things: infrastructure, green jobs, and clean air and water. Gillibrand has also endorsed putting a price on carbon emissions, something that isn't explicitly called for in the Green New Deal. Scott Ferson, a Democratic strategist, said Gillibrand likely couldn't afford to be seen as a supporter of fossil fuels when she's running as a Democratic presidential candidate. "It would be wrong to not acknowledge that, in a Democratic primary, it's more important where you end up on issues than where you start. And on this one, the Democratic Party is clearly opposed to fracking," he said. Gillibrand made previous comments about the "economic opportunity" that fracking could bring when gas companies, backed by some landowners in New York's Southern Tier, were eyeing parts of the state that lay atop the Marcellus and Utica shale formations for potential development. But environmental concerns about fracking and its impact on air, water and the climate were also growing at the time. Neighboring Pennsylvania had seen an unprecedented gas boom, spurring anger among New Yorkers who wanted the same economic development on their side of the border. Holahan said Gillibrand's shift may have been the result of an honest change of heart or perhaps a determination that fracking can't be made acceptable. Cuomo's decision to outright ban fracking by executive order in 2014 for environmental reasons made the issue moot. The oil and natural gas industry has long pushed back and argued that fracking is safe. "There's a non-cynical answer, which is that over time, her personal feelings on it changed as more evidence and information came out," Holahan said. "I'm always willing to give people the benefit of the doubt, though I'm guessing this is more political."